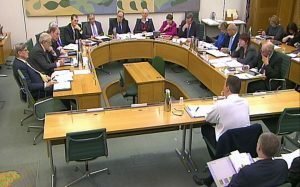 Prime Minister David Cameron answers questions in front of the Liaison Select Committee at the House of Commons, London. Summary: reports of Parliamentary Committees are very important as they try to hold the government to account. The cross parliamentary nature of these committees and the fact that most of the reports are agreed by the great majority of the committee make them much more balanced and less partisan than so many political interventions. With the decision to hold a snap General Election many of these reports (there have been more than thirty since Parliament broke up) are likely to be ignored. We look at a number of those that are particularly important and should be taken seriously. Now that the election campaign is underway we are braced for series of misleading announcements and claims. One of the better developments in recent years with our parliamentary system has been the increasing importance of parliamentary committees. These are groups of MPs chosen from across the political spectrum and charged with looking at particular issues of concern. They then produce a report which is agreed by the committee as being relatively fair and balanced. The reports of these committees therefore are important as they are one of the most effective ways of holding the government to account. With essentially no parliamentary opposition, the government has been inclined to ignore reports it didn’t care for. It is important that we do not lose sight of what the latest batch recommend. The government would dearly like us to forget all about them. We really must not do that. Feeding the Nation: Labour Constraints: there is a widespread concern amongst horticultural and agricultural suppliers about the difficulty in finding labour. The Environment, Food and Rural Affairs Committee expressed great concern that Brexit could make the current bad situation very much worse. They mentioned specifically that the reality of what is already happening on farms around the country is utterly different from the impressions given by the government which appear to be largely ignorant of the current needs of agriculture and certainly of its future needs. Their report is here: https://www.publications.parliament.uk/pa/cm201617/cmselect/cmenvfru/1009/100907.htm . NHS Ambulance Services: another report from the Public Accounts Committee (yes, they have been busy) examined reports that emergency patients are taking far too long to get to hospital by ambulance. There is a target to get patients to the emergency department within 15 minutes. In 2010-11 80% of transfers met that target whereas in 2015-16 that number had dropped to only 58%. The Committee found that the ambulance services had great difficulty in finding labour and that the high sickness absence rates experienced by ambulance services caused by the badly overworked way they are currently operating in is exacerbating these problems. This report can be found here: https://www.publications.parliament.uk/pa/cm201617/cmselect/cmpubacc/1035/103505.htm#_idTextAnchor004 . Strategic Defence and Security Review 2015: Headline Ambitions for the Army. Outsidethebubble.net has posted articles dealing with the desperate problems of the current MoD procurement programme and the remarkable unreliability of so much of the equipment we depend on for our defence (see: http://outsidethebubble.net/2017/03/16/britain-defenceless-in-the-21st-century/ and http://outsidethebubble.net/2017/04/10/defence-in-the-21st-century/). Now the Defence Committee has expressed its concern about the lack of trained soldiers in the Regular Army. In 2012 the target was lowered from 95,000 to 82,000, but it currently remains stubbornly below 80,000. It expresses considerable concern about the inability of our Army to cope with any significant external aggression. They also expressed concern that the Review has added nearly £25 billion of new commitments to cover an, as yet uncosted, programme for the new Mechanised Infantry Vehicle. This leads to considerable budgetary uncertainties for the future. This report can be found here: https://www.publications.parliament.uk/pa/cm201617/cmselect/cmdfence/108/10810.htm#_idTextAnchor082 . Housing: State of the Nation: the Public Accounts Committee is particularly concerned about the remarkable complacency and lack of urgency in dealing with the matter of homelessness. the Department for Communities and Local Government plan to build a million houses over the next five years but more than 1.4 million are actually required. This is a matter which has also been dealt with on outsidethebubble.net (see: http://outsidethebubble.net/2016/09/27/a-fairer-deal-solving-the-housing-crisis/ ). This report may be found here: https://www.publications.parliament.uk/pa/cm201617/cmselect/cmpubacc/958/95802.htm.